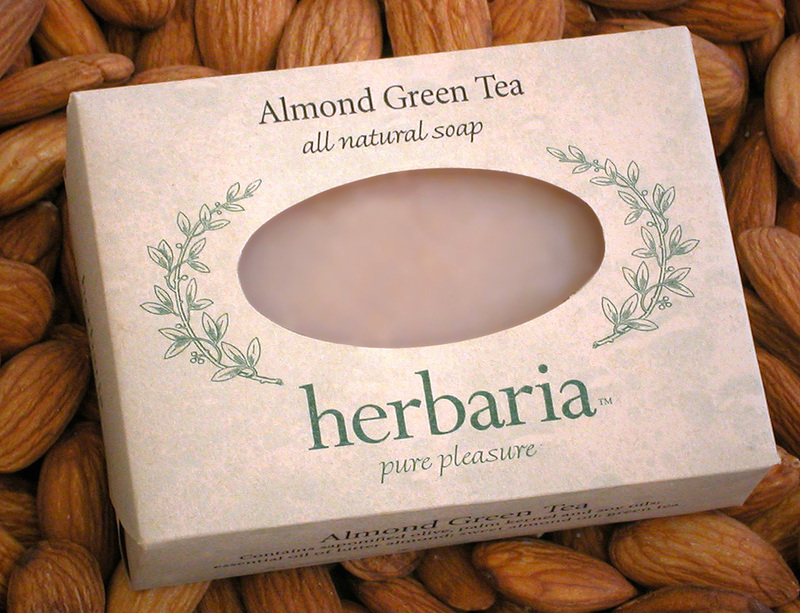 Almond Green Tea tops our list of over 60 soap varieties, all exceptionally moisturizing, lathering, and long-lasting. To create the rich, characteristic almond aroma of Almond Green Tea, we add to our base costly essential oil of bitter almond, prized for its marzipan scent. We do not use imitation almond flavoring. We refuse to use synthetic fragrance oils in any of our products. Beyond its beautiful bouquet, Almond Green Tea doubles the health benefits to your skin, from head to toe. The emollient in this bar, sweet almond oil, is easily absorbed through the skin and nurtures it with calcium, magnesium, Vitamins A, B1, B2, B6, and E.
Green tea, the source of the warm brown color of the bar, is a natural antiseptic. Laboratory research indicates that green tea, an antioxidant, reduces free radicals and thereby provides a layer of protection against skin cancer and aging. We suggest Almond Green Tea for breakouts, blemishes, and sunburns.